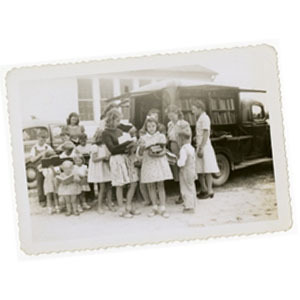 With the assistance of the Association of Farm Women and the South Carolina State Library in 1932 the Greenwood County Library bought its first Bookmobile, to serve those in more rural areas. The Bookmobile was used to get books to people that were over 5 miles away from Greenwood and could not easily get into town. Over the years there have been many different Bookmobiles, but the Library continues to believe in providing services at many locations including schools, daycares, and senior centers.